Ethan and I were walking past the ride and decided to stop for a couple minutes to watch, wondering if we might be able to catch a glimpse of Micah. Sure enough, I caught the tiniest glimpse of him as they went up the hill and snapped away as they came down. He’s in the very front. Then we waited for him to come off the ride so we could snap a couple more pictures. We are making this layout in Scrap Club this week. It would work well for outdoors pictures, but it could work well for many things. 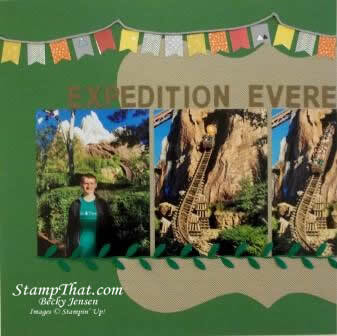 ” TheExpedition Everest Scrapbook Layout II” Looks like a lot of fun. 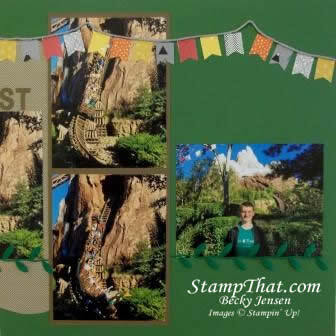 You did a wonderful job Becky, thank you for sharing.